To put it frank: Hip-Hop needs more reverential work. Over 40 years in, the game sets the tone for pop culture, but there doesn’t seem to be enough documentary work chronicling the trends or their cultivation. This is especially true when it comes to grills. The pieces that some look at as accessories to complete their “urban” ensemble at parties actually have stories, and Brooklyn-based photographer JazzShoots tells them visually in her Grillz booklet. The 95-page book contains hi-res shots ranging from random concertgoers to well-known artists like Lil Uzi Vert and the Flatbush Zombies. The dramatic images run the gamut of subtle front pieces and fangs to full-on gold sets that would make a Houston native look twice. 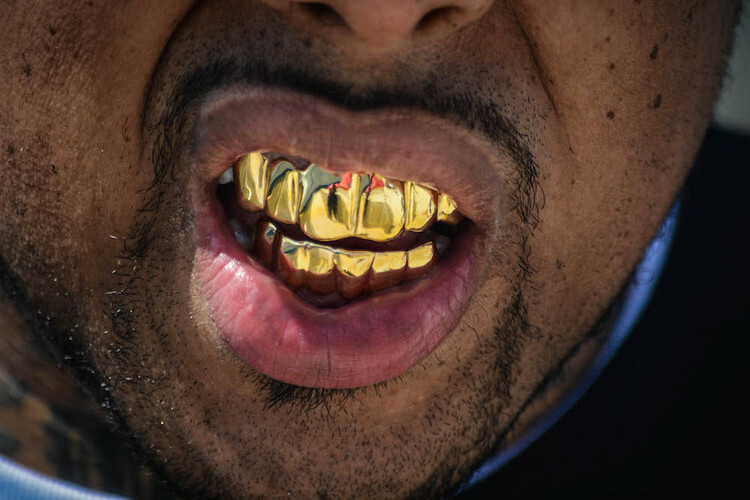 Grillz is a comprehensive project that showcases JazzShoots’ considerable skills through the lens of a long-running hip-hop essential. Saturday, she will be partnering with Cypher League, Brownsvillain I.O.D, Grace Poteet and Rich Silence on a party to celebrate the book in Brooklyn. Hip-Hop artists Akai $olo and Hack will also be performing. You can purchase the limited edition, leather bound coffee table book here. You can purchase tickets to the event here. At Home With Oh Pep!